I’m lucky to have so many precious keepsakes that help me preserve her memory, but almost nothing means more to me than a thank-you card she wrote to me when she stayed with me in Ottawa the first summer after I moved here. In 2013, six months after I graduated from teachers college, I was offered a job working for the Ottawa-Carleton District School Board. I can’t even begin to put into words how much my parents helped to get me settled in my new home. They drove me here for every interview and information night, searched tirelessly for a place fitting for their little girl, and then packed up my van, their car, and another moving van after my bed fell off the roof of my van onto the road. Shockingly, no people or mattresses were injured during the convoy, though we did briefly lose Dad along the way. I quickly fell in love with Ottawa, made new friends, and found lots of fabulous restaurants for when family came to visit. 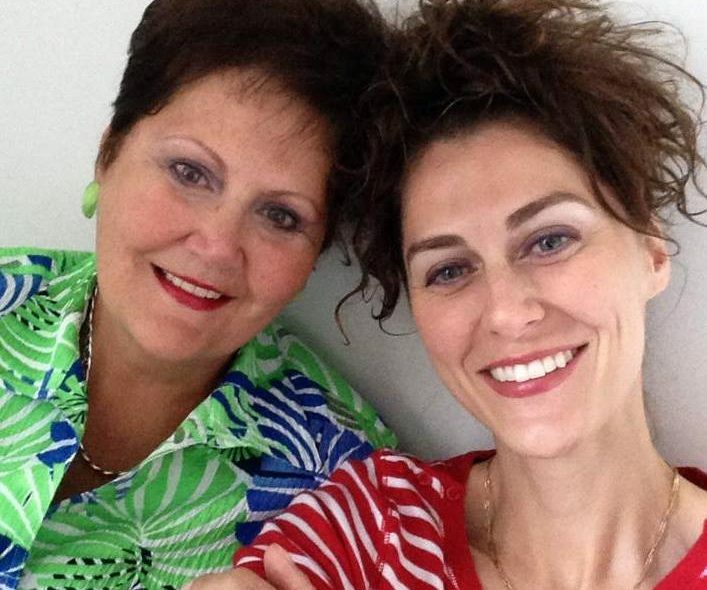 In the summer of 2014, having successfully completed my first school year as a teacher, Mom came to visit me for one of our signature girls weekends, only this time, we spent an entire week together. I wanted to make things perfect for her as she always did for me. I cleaned my apartment from top to bottom, washed bedding and towels, and bought all kinds of our favourite treats and drinks. Every morning I made us a big fruit bowl for breakfast–strawberries, bananas, pineapple, blueberries, raspberries, blackberries, yogurt, cottage cheese, and trail mix–served in bed, of course. We’d leisurely clean ourselves up and make ourselves presentable to go out into the world. For lunch. And other things, but food was our first priority. I took her to my favourite Indian restaurant (conveniently located in the same building as my former apartment), my favourite salady place, Thai place, Greek place, and the list goes on. We went shopping, toured the city, ate BeaverTails, watched movies, laughed, cuddled, and had the BEST time. The picture at the top of this post is from that special week we spent together. It’s my Facebook profile picture too…and I just can’t change it. Not yet, anyway. I want to remember that week every day of my life. 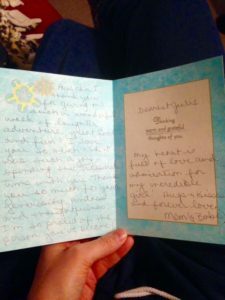 I mentioned near the beginning of this post that Mom wrote me a thank-you letter before she returned back home to Dad. I want to share it with all of you. I cry every single time I read this. Not just because I miss her with every fiber of my being. I cry because it’s a love letter. I will never have any doubt how much that beautiful woman loved me. And if there is ever a day that I doubt myself, or the path I’ve chosen, I’ll read this letter and remind myself that she’s proud of me, that she believes in me, admires me, treasures me. My dearest mother, my best friend in the world, here’s to all the girls weeks and weekends we had together. Till the next one. What a lovely tribute to your mom. She was a truly special woman. Hugs to you on this day and all days. That card is something to be treasured. I had lunch with one of my Mom’s friends today, who has now become one of my dearest friends, and we talked about how it seems like she’s only been gone a week…and other times it feels like forever. I was dreaming of Jmaka last night. So many losses. But then new babies come along, and there are new books at the bookstore written by special friends. Sadness and wonderfulness all jumbled up together. What a blessing to have friends who understand and are there for all of the good and all of the bad. Love you, Sweetie, always! Amen to that! It’s wonderful that you’re so close to your mom’s friend. That’s happened in some cases with me as well. I’m so grateful for you, every day of my life. Love you, A-M! Two years ago I was in Colombia when I heard the devastating news about your mom. I cried and cried. Here I am in Colombia again and I’m reaching for tissues again. I’m so thankful I got to know your mom and I know first hand what a beautiful lady she was. Yes, she definitely loved you with her heart and soul. Great tribute to your mom.I lost my mother 3 months ago. And at 34 I never thought it’d be this early.I hope you dont mind me sharing my sadness. My mom was my rock.In her last breaths I played her fav songs and like to believe she is dancing and still moving up there just like she wants me to down here. Previous post Weekend Writing Warriors #63! Next post Weekend Warriors #64!